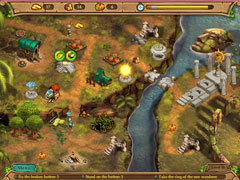 Unleash the awesome power of nature in Weather Lord: In Pursuit of the Shaman! 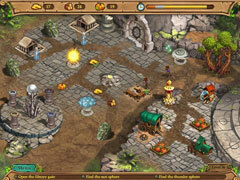 Unleash the awesome power of nature in Weather Lord: In Pursuit of the Shaman! An earthquake has devastated a once peaceful land and shattered the lives of its natives. But that was only the start of their troubles! The country is now teeming with unpleasant creatures, and an evil shaman is making a bid for absolute power. As a weather lord, you must lead a band of brave warriors across the ruined landscape to defeat the enemy. Along the way, you'll help the natives by gathering resources, repairing their villages, and completing quests, using sunlight, rain, wind, and thunder to replenish crops. eliminate enemies, and remove obstacles. Weather Lord: In Pursuit of the Shaman allows you to complete these tasks as you choose: you can either work quickly to reap the best awards and achievements, or take your time and enjoy the colorful visuals, cheerful soundtrack, and addictive gameplay. With the elements at your fingertips, there will be no stopping you in Weather Lord: In Pursuit of the Shaman! 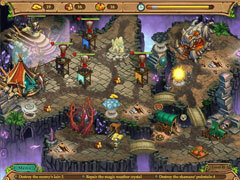 -Rescue the Magic World from hordes of monsters!